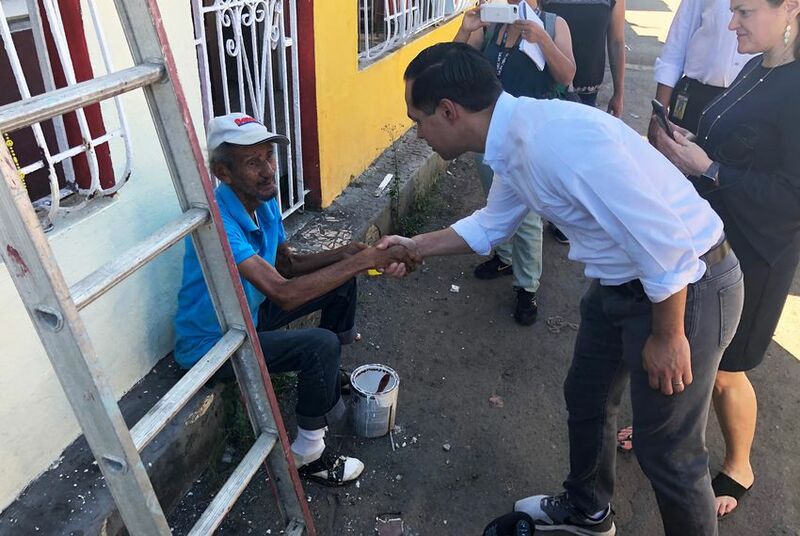 SAN JUAN, Puerto Rico — In his inaugural trip as a presidential candidate, Julián Castro passed on the cornfields of Iowa and the small towns of New Hampshire for this oft-overlooked island, a U.S. territory that holds primaries but ultimately does not get a direct say in the final 2020 vote. With Puerto Rico still reeling from 2017's Hurricane Maria — and resentment still simmering over President Donald Trump's lackluster response to it — the symbolism was clear. And if it was not, Castro drove it home during a speech Monday morning to Hispanic political leaders. "I want the people of Puerto Rico to know this," Castro said. "If I'm elected president, I will work each and every day to make sure that not only will you recover but that you will thrive, to make sure that you are respected, to make sure that you count." With his presidential announcement Saturday and immediate Puerto Rico trip, the former U.S. housing secretary and San Antonio mayor moved quickly to distinguish himself as the candidate of an increasingly diverse Democratic Party — one that would know to pay just as much attention to a natural disaster here as it would in Texas. His rollout also has highlighted his status as likely the only major Latino contender, and while he starts the race facing long odds, his candidacy alone represents a watershed moment for Latinos. "Julián is the most prominent Latino to ever seek this office, and it’s the only office that we haven’t held — the Oval Office," said Cristóbal Alex, president of the Latino Victory Fund, whose summit Castro spoke at Monday morning. "And when I watched his announcement, I made sure that I was with my daughter and a group of others because it’s a historic moment for our community." To be sure, Castro needs all the help he can get to stand out in what is likely to be a crowded primary. He hardly registers in most polls, and much more attention is being paid to another Texas Democrat who could run for president: Beto O'Rourke, the former El Paso congressman who would be expected to also make a serious play for Hispanic support. While Castro may end up as the only Latino candidate, he is mindful of being defined by the distinction. Castro tackled the balancing act during an interview that aired over the weekend on Univision's "Al Punto," during which host Jorge Ramos asked Castro if he planned to run as a "Hispanic candidate," putting an emphasis on those two words. "Well, there’s no question, of course, that I am Latino,” Castro said, chuckling. "And I look forward to campaigning in [English and Spanish]. But when you run for office, you have to represent everybody, and so my hope is that people will judge me by my ideas and the vision that I have for the future of this country." Castro laid out that vision at an announcement at San Antonio's historic Plaza Guadalupe on the city's predominantly Hispanic West Side that featured a mariachi band and a national anthem being led by Tejano artist Roger Velasquez. Castro briefly spoke Spanish during his speech, repeating a sentence reflecting on what his immigrant grandmother would think about his rise and declaring himself a presidential candidate. In a preview of a conundrum all 2020 candidates will face, it was not long after Castro began his Puerto Rico trip that Trump hijacked the news cycle with his criticism of a delegation of congressional Democrats for already being on the island during the partial government shutdown. Speaking with reporters Monday as he prepared to tour Maria recovery efforts, Castro defended his fellow Democrats as doing "substantive work" on the island to learn about the recovery — and then issued a broadside against Trump for "not even doing a part-time job" as president. The rest of Castro's visit to San Juan was far less politically charged. Accompanied by the city's mayor — Carmen Yulín Cruz, a fierce Trump critic — Castro toured a community center equipped with supplies such as solar panels and water filters that can be put to use after disasters. Then they walked through the surrounding neighborhood, surveying homes and businesses still bearing the scars of Maria. Afterward, Castro visited a group working to restore Caño Martín Peña, a channel that cuts through San Juan and the dredging of which has taken on new urgency after Maria. As he took in the impact of Maria, Castro cited his time at the U.S. Department of Housing and Urban Development, when he visited and worked with states after they were struck by natural disasters. He stressed the need for communities to rebuild in a resilient way, citing a competition he spearheaded at HUD to incentivize communities to do so. And at one point, he reached back to his tenure as San Antonio mayor to relate to a man frustrated with having to navigate the local government bureaucracy when it came to water problems. Speaking with reporters in San Juan on Monday, Castro showed some fluency in the territory's issues while avoiding bold pronouncements. On whether Puerto Rico should be granted statehood — a perennial debate on the island — Castro praised the "self-determination" of Puerto Ricans and insisted the decision should be up to them. On the federal oversight board that manages the territory's long-troubled finances, Castro said he was concerned about the austerity measures the board has approved, noting Puerto Ricans "have already suffered a lot." Castro is not fluent in Spanish, and he has long bristled at the notion that speaking the language defines the Latino experience. In San Juan, Castro relied on some translation as he held forth with locals. "So-so," Castro said when asked how his Spanish was nowadays. "I'm getting to use it more." In any case, Castro was well-received by the Puerto Ricans he encountered. Some acknowledged they knew there was little he could do to help as a presidential candidate and former Cabinet official but said they appreciated his willingness to listen. "When you hear that people care, it's the only thing that we need," said Omayra Rios, a 49-year-old community leader. "We don't insist that much on party, but in Puerto Rico, we need people who care." After his Puerto Rico visit, Castro was scheduled to travel to a more traditional post-announcement backdrop for presidential candidates: New Hampshire, the first-in-the-nation primary. Among his stops there will be the popular Politics and Eggs speaking series Wednesday morning at the New Hampshire Institute Of Politics at Saint Anselm College. During his time in San Juan on Monday, Castro wasn't the only figure in the burgeoning 2020 campaign who was around. A potential candidate, U.S. Rep. Eric Swalwell, D-Calif., was also visiting Puerto Rico and mingled with the crowd after Castro's speech at the Latino Victory Fund summit. It was there, though, that the uniqueness of a Castro candidacy was broached. During a session on the Latino vote, attendees were shown poll results finding Latinos would be 11 percentage points more likely to vote Democratic in 2020 if Castro is on the ticket compared with a nonspecific Latino candidate. Castro and the House Democrats were hardly the only attraction on the island in recent days, which included the Puerto Rican opening of the hit musical "Hamilton." The play's creator and star — Lin-Manuel Miranda, a New York native of Puerto Rican descent — spoke before Castro at the Latino Victory Fund event — and made a vow that may have caught the attention of the newly minted White House hopeful. "We’re going to make sure we vote for people who put Puerto Rico in the spotlight," Miranda said, "and keep Puerto Rico in the conversation."